What features are in the help menu. How to enter an unlock code to remove trial restrictions. How to get detailed diagnostics. How to obtain product version and vendor contact details. Goes to StoryServer documentation website. Display a list of Shortcut Keys. For instructions for usage, see: Find Shortcuts). Menu Help – Changes cursor to '?' and redirects you to the UI’s help. Displays help how to use this UI. 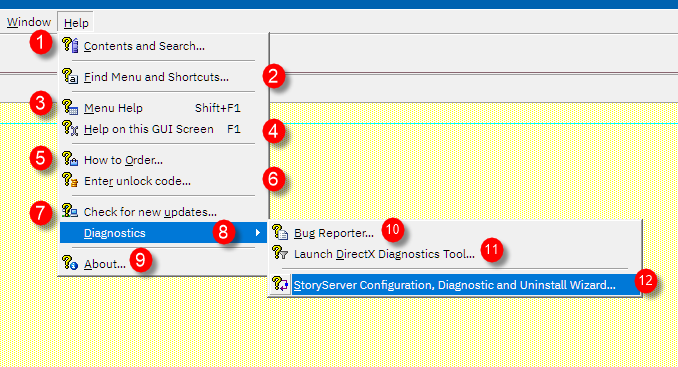 StoryServer Configuration, Diagnostics, and Uninstall Wizard.